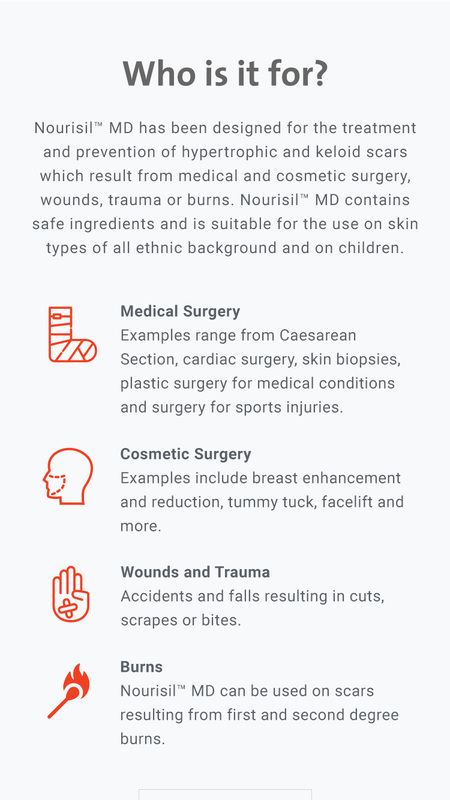 Fagron are a leading pharmaceutical company specialising in the design, development, production and marketing of customised pharmaceutical products in the UK. The team at Fagron needed us to help market and create an online presence for an exciting new product of theirs, Nourisil. 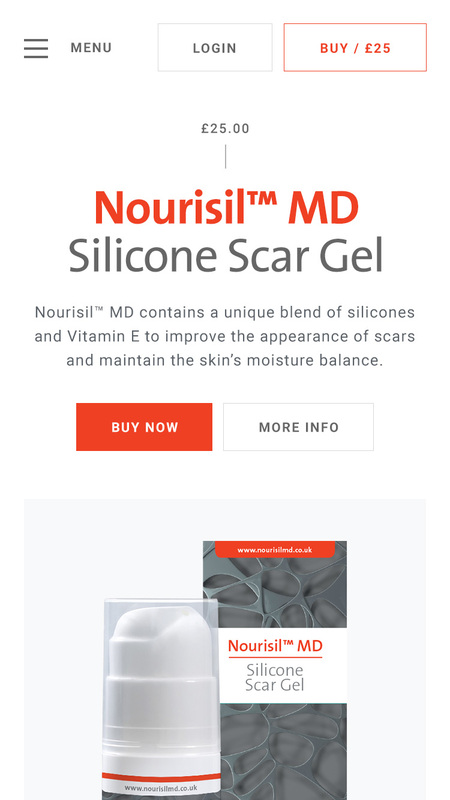 Nourisil is a self-drying silicone gel which is applied to the skin to flatten, soften and smooth scars. Containing a unique blend of 5 silicones coupled with Vitamin E, it helps improve the appearance of scars and maintain the skin’s moisture balance. It also helps relieve the itching and discomfort of the skin caused by scars, all whilst reducing any pain and redness. 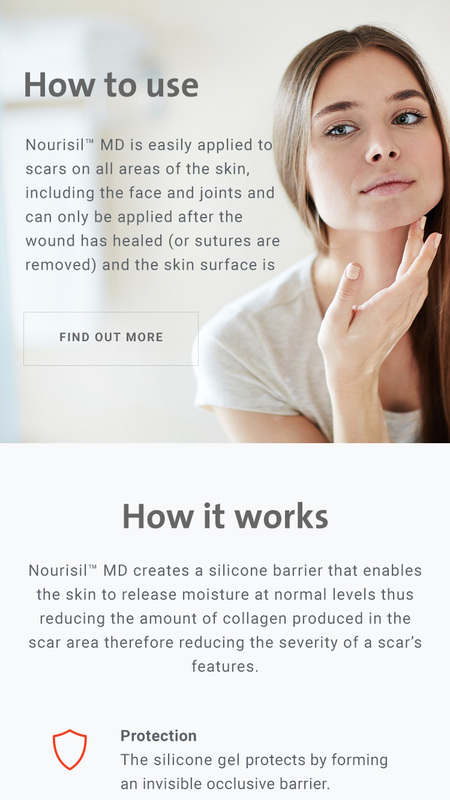 Different from other competitors out there, Nourisil needed a website which would reflect the product’s key selling points and reinforce its market-leading status. We knew three main questions needed to be highlighted as soon as you landed on the site – who is it for, what are the benefits and how does it work. We decided to have clear, full width panels dedicated to each question, so the user could instantly see who Nourisil targets and why they should be using it. Call to actions needed to be prominent and easily accessible throughout the site since the product is available to purchase online. By providing an eCommerce solution, we allowed the Nourisil team to sell and manage stock and orders themselves in the CMS. This provided them with the ability to offer discounts and create user accounts for repeat purchases. Since launch we’ve added a host of useful features, such as an abandoned cart function and dedicated care guides. The websites serves as a great platform for users to purchase the product and encompasses everything the Nourisil brand is about. There have already been a number of orders since launch and lots positive media attention. We worked with Union Room to create websites for some new products we launched in the UK over the last 12 months. The team at Union Room have an eye for design and detail and this was key for us as product information can be quite dry so it was important this was communicated to the customer in an aesthetically pleasing and brand led manner.